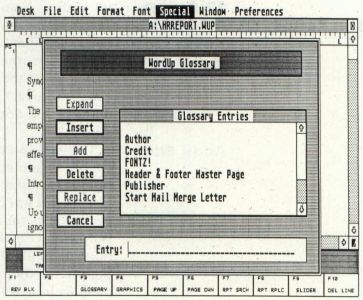 WordUp is a powerful word processor for the Atari ST that utilizes GDOS to produce high-quality printed output, as well as multiple sizes and typefaces, both on the screen and in print. 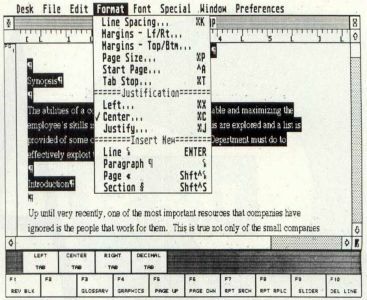 It has many features not found in other word processors in its price range, although it does not have all the features of WordPerfect. It should be stated right up front that I wrote the original manual for WordUp. However, as I was paid a lump-sum fee and have no stake in the company, you can be sure that this review is totally unbiased. I do know the program quite well and am also a writer who has outgrown several of the low-end word processors available for the ST. I will say that I like WordUp and feel it is an excellent writer's tool. As mentioned earlier, WordUp is a GDOS application, able to use many fonts and capable of printing in the highest resolution your printer can handle. Usually, GDOS means an agonizing and confusing setup procedure, with many false starts. The original WordUp manual had a lengthy section on how to get everything set up. I often felt that it was the most complex thing about the program! However, the current version includes an installation program that questions you about your system (how many drives, whether they are double-sided, how much memory, etc. ), then proceeds to painlessly extract the files you need and copy them to backup disks for you. Compare this installation procedure with the one for Microsoft Write (which I never did figure out). 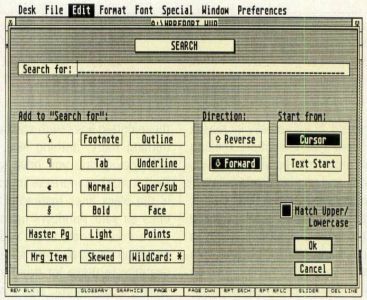 WordUp supports all the functions that have come to be expected from any program that calls itself a word processor. Four files can be open at once in separate windows, and you can cut and paste blocks of text (including between the documents) whenever you like. Of course, you can merge text, search and replace, use various text attributes (bold, italics, etc.) and set the text format. From there, though, the list of additional features is quite impressive. As mentioned earlier, you can select from multiple typefaces and point sizes in the document, and these will appear on the screen looking pretty much like they will when printed. You can also import three different formats of graphics: Neochrome, DEGAS (both compressed and uncompressed) and GEM (*.IMG) files. Once a graphic has been added, you can resize it, crop it and adjust the aspect ratio using the mouse or keyboard commands. 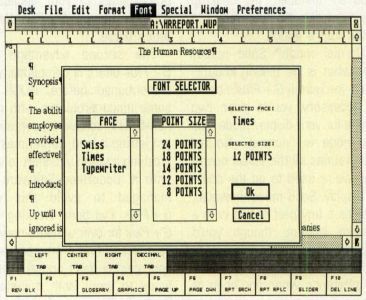 A ruler runs across the top of the screen, making it easy to set and remove the four different kinds of tab stops (left, right, center and decimal) as well as set margins. The text automatically reformats as you type in new text. Handy utilities available from the menus let you format a disk, check disk space and rename or delete a file. If you have activated WordUp's backup feature, you can even revert to an old version of your document. Another nice feature is that you can select the text you want to work on (for block operations, for example) by clicking and dragging with the mouse. This may seem like a small thing, but many word processors for the ST only allow you to select whole lines using click and drag. You can select a whole paragraph by double-clicking in the left margin alongside of it, and there are keyboard equivalents for all menu options. WordUp even lets you select the word or sentence the cursor is currently on with two keystrokes. When a block has been highlighted, you can modify its font, limit the search-and-replace to just that block or adjust other attributes, such as margins. Of course, you can set top, bottom, left and right margins, but here again, WordUp allows a lot of flexibility. You can set the margins for the entire document, just a paragraph or for a section (that usually contains multiple paragraphs). Tab stops can be set for the document or by section as well. What this means is that paragraphs can have different margins and be indented or tabbed differently for effect. Margins and tabs can be set using the menu, which brings up a dialog box, or by using the mouse with the ruler at the top of the screen. Even the rather mundane search-and-replace functions have some extras built in. For example, you can search for special characters (carriage returns, section markers) as well as text effects—that is, where the text becomes bold, underlined or changes face or point size. Note that while you can search for special effects, you can't include the effect in your replacement string. Searching can be either forward or backward, and can start from the cursor position or from the beginning of the document. WordUp also supports "master pages." A master page sets the text (and graphics, if you like) that will appear on every page when the document is printed out. Thus, you can put headers, footers and letterhead graphics on a master page, and these will print out on every page. You can have different master pages for left- and right-side pages, and you can use as many different master pages as you need. The current time and date can be printed anywhere in the document, including in headers and footers. Endnotes (but not footnotes) are supported, and you can set a different font for the end-note. The manual and tutorials make quite a few references to footnotes (which were supported in earlier versions, but had problems). There are also some extras built into WordUp that will be appreciated by "power writers." The glossary feature lets you expand single words or short phrases into whole blocks of text, including special formatting. You can even store a whole document as a single glossary entry. Blocks of text can be added to the glossary by simply highlighting the block and selecting the appropriate button from the glossary dialog box. Full mail-merge capabilities are also supported. Mail-merge is a little complex, because it involves a text file, a database file and a control file, which puts the two together. However, mail-merged letters are very flexible, and both fixed field length and SDF-type files are supported. An appendix to the manual details how to set up a file with many of the popular databases. WordUp is missing some things that make it less ideal for long documents. It has no index- or table-of-contents-generation capabilities, and no spell checker. Also, the price paid for the multiple typefaces and point sizes is that the scrolling speed is quite slow. It is not so slow that it is unusable, but scrolling over long distances can be cumbersome. The problem is that the screen is drawn in graphics, and the ST's built-in character set is not used. The current version of WordUp is quite a bit faster than the original, so progress is being made in addressing the slow scroll speed. As is true with other programs using GDOS, the output is sllloooow. 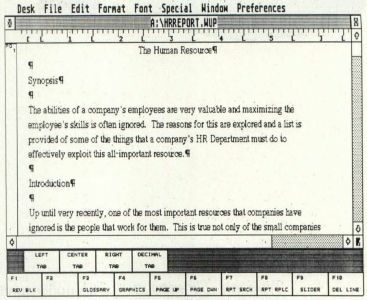 Even when you don't need to use fancy fonts, there is no way to get quick draft output (perhaps just using the printer's built-in font) except by printing in ASCII format, which loses so much of the document's formatting information that page breaks may not be in the right place. It would be nice to get a good quality printout that didn't include changing typefaces, etc., when that was necessary. WordUp is more than a simple word processor, yet not quite a desktop publishing program. Its powerful formatting features, multiple text faces and sizes, ability to import graphics and high-quality output make it a serious business tool for short- to medium-size documents. There are better word processors for writing books, but they cost much more, and are harder to learn to use. All in all, if you do any more writing than an occasional letter or keep a diary, and can live with the slow speed of scrolling, you should take a look at WordUp for your writing needs.